Hi loves! 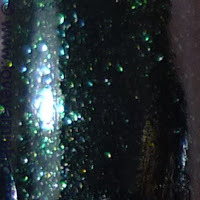 How about (another) dark green polish? It feels to me as I haven't posted or worn anything else besides colors like these.. must be Fall kicking in! The one I am showing you today is a england Tess D'Urbervilles, one of the Gothic Beauties. I got this as a gift and I am so happy to have it in my stash! a england is one of my favorite brands ever and she has released so many pretty polishes already ♥. Tess D'Urbervilles is a gorgeous black polish filled with emerald shimmer and sparkle. Somehow on my pictures the polish doesn't look as shiny, but I can assure you it did, especially combined with my beloved Essence topcoat! It applied easily with 2 coats, though I did have to wait in between those coats to avoid dragging at the cuticles creating bald spots. The sparkle was visible in almost every kind of light, sometimes very subdued and a little beneath the surface, sometimes in full shimmering glory. Do you own any Gothic Beauties? And which is your favorite? This really is a beautiful colour. Some how it manages to be both subtle and totally lush at the same time! I can't wait till I have some A England polishes in my stash! This one is gorgeous! I'm glad you mentioned that the shimmer is visible in every kind of light. I was wondering about that myself. In many pictures it looks like the shimmer might be too subtle in real life. Looks gorgeous on you! Thanks Elizabeth! Hopefully the other one I got is as pretty :). You should really get some! They ship free worldwide :). To me it was Kripa, though sometimes it's just a hint of a sparkle :).